Baidu and Hyundai Motor Group claimed that they inked a MoU (memorandum of understanding) for IoV (Internet of Vehicles), indicating their promise of intensifying cooperation on next-generation linked vehicle techs. 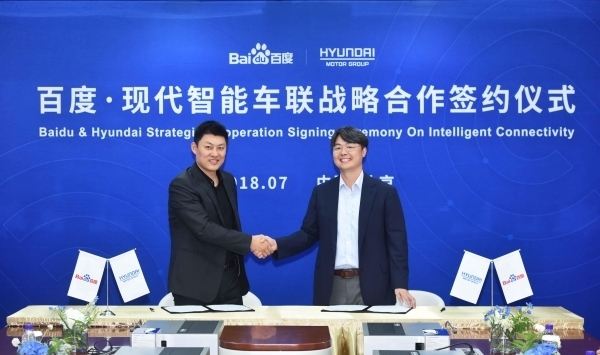 Baidu and Hyundai will co-design a linked car service that offers a huge variety of in-car content including live information and real-time traffic status about the consumer’s end-locations on the basis of maps, big data, Portal services, and AI (artificial intelligence). Via such a service, Baidu and Hyundai anticipate meeting the increasing requirement for connectivity services amongst users in and beyond China. Baidu and Hyundai will also join hands-on building Hyundai Motor Group car models equipped with Xiaodu In-Car operating system for mass production. This strategy plans to improve the application of AI in IoV via product innovation and next-gen technologies. Baidu and Hyundai have also decided to carry on efforts in pacing up the rollout of intelligent car-to-home offerings. The joint venture’s ultimate objective is to claim an upper hand in the spirited IoT industry. Hyundai also inked a MoU with China Unicom, the second-biggest telecommunications supplier in China, to co-design a predictive-analytics service. Speaking of Baidu, BMW this week claimed that it will join hands with Baidu to design self-driving tech in China. As a fraction of the deal, BMW claimed that it will take a seat on the panel of Apollo, the self-driving platform by Baidu. Since rolling out in July last year, Baidu has inked up over 100 automotive and technology firms to take part in the platform, comprising Daimler AG, Ford Motor Co., and Intel Corp.
Auto manufacturers are more and more extending beyond their conventional business of producing cars and seeking to take part in the development of fresh techs shaping the segment, such as car sharing, autonomous driving, and ride-hailing.